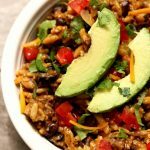 Slow Cooker Cheesy Taco Orzo–an easy family friendly meal that has a lot of Mexican flare. 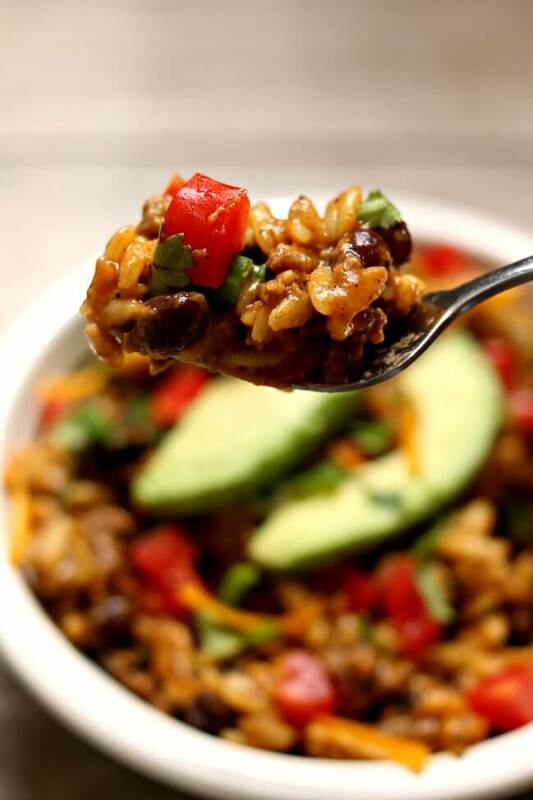 Orzo pasta is slow cooked along with ground beef, taco sauce and black beans. Fresh ingredients like diced tomatoes, green onions, cilantro and shredded cheddar are stirred in later to create a flavorful meal. I’m on a quest to find and make the best one pot meals. I love the idea of having your whole meal–protein, carbohydrate and vegetables all in one pot. This one is a keeper! 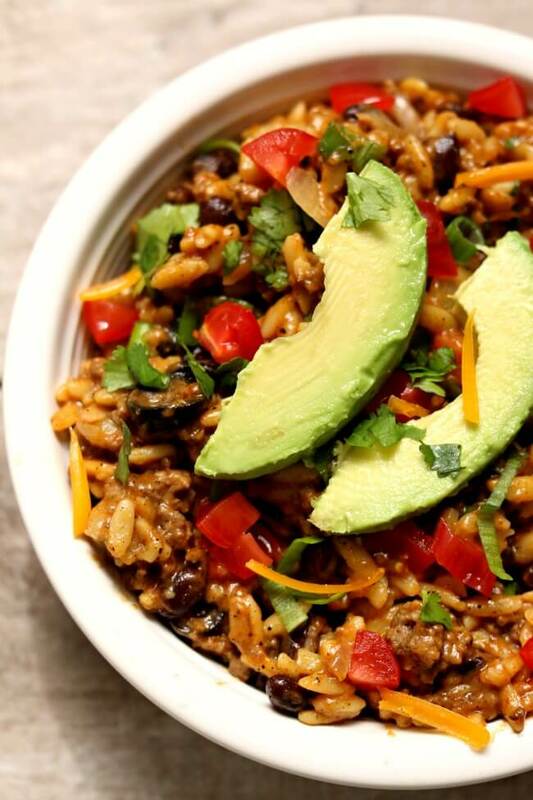 Kids and adults will love this orzo with all the flavors of tacos. Beef–I used ground beef but you could totally use ground turkey or ground chicken too. Orzo–Sometimes I buy it in a box with the other pastas but this time I bought it in the bulk section at Winco for a dollar a pound. I have yet to find whole wheat orzo on the shelf. I wish! Black beans–feel free to use whatever kind of beans you want. I like black beans for this recipe but kidney beans or pinto beans would work well also. Or if you are beans adverse then leave them out all together. Cheddar–I used cheddar but you can also use a mexican blend of cheese. Taco Sauce–find this with the other Mexican foods at your grocery store. I like the mild green sauce but if you want a little heat you can use the red medium sauce. 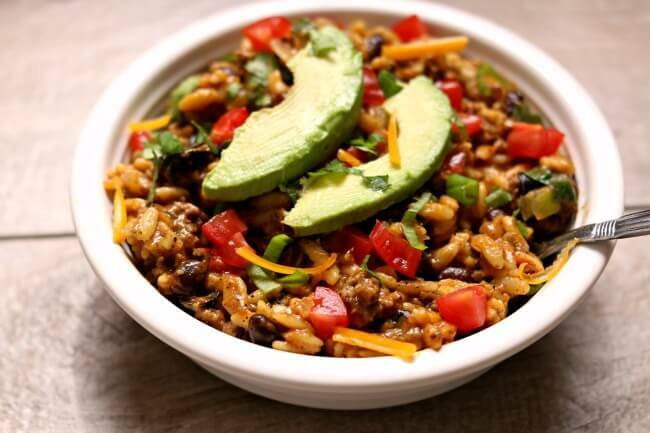 To make Slow Cooker Cheesy Taco Orzo I used my 6 quart oval Kitchenaid slow cooker. * I love this slow cooker (you can see me talking about it in a video here). It cooks low and evenly. I love the medium heat choice because most slow cookers that I’ve seen only have the option of cooking on low or high. If you’re going to buy just one slow cooker, this is the one that I recommend. An easy family friendly meal that has a lot of Mexican flare. 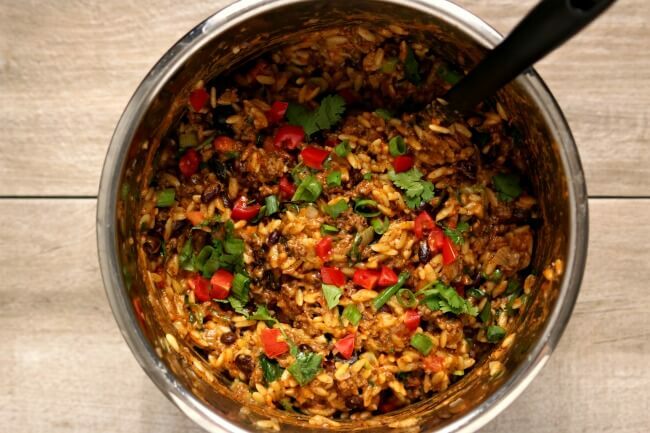 Orzo pasta is slow cooked along with ground beef, taco sauce and black beans. Fresh ingredients like diced tomatoes, green onions, cilantro and shredded cheddar are stirred in later to create a flavorful meal. Turn your stove on medium high heat. Heat up a pan and add in the ground beef. Break it up with a wooden spoon and brown it. Sprinkle in the taco seasoning and stir. Add in the onions and saute for 3 minutes. Add in the garlic and saute for 30 seconds. Drain off excess grease, if there is any. Add the mixture to the slow cooker. Add the broth/water, orzo, green taco sauce and black beans into the slow cooker. Remove the lid and stir in the tomatoes, green onions, cilantro, olives and cheddar. Season with additional taco seasoning and salt and pepper, if needed. 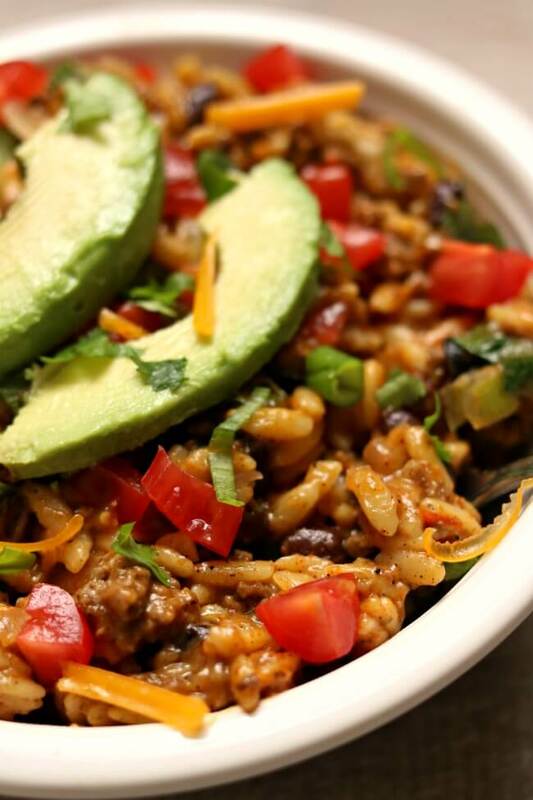 Like this recipe for Slow Cooker Cheesy Taco Orzo? Get all my new recipes delivered to your email inbox by signing up below. This turned out terrible for me, like another reviewer. Gummy, mushy mess! I want to love this because it has some of my favorite flavors, was wonderfully easy, and made the house smell amazing. It’s gloppy, unfortunately, and doesn’t seem like the best use of these ingredients. I am glad we tried it, though, and happy to have the taco seasoning recipe. Hmmm, how long did you cook the orzo? Mine was perfect. Sad. I cooked it for two hours , as directed, and used whole-wheat orzo, which should have taken longer than regular orzo. Wah! I don’t have a Wegmans. Do you have a Sprouts? I buy the whole wheat Delallo brand orzo there. Lucky! No I don’t have a sprouts. How do I change pressure cooking time to slow cooking time? Hi Nancy, for this particular recipe you will cook on high in your slow cooker for 2 hours. This looks amazing! Can’t wait to try it!! Looks easy enough for me to do. But if my crockpot only has low and high, which one should I use?